In July of 2018, the Google Chrome update will cause non-secure sites (websites with no SSL certificate) generate a message that the site is NOT secure and make the visitor click to agree to browse the insecure site. While an SSL certificate is not required for your website to function properly, the Google Chrome security update will begin to highlight non-secure sites in a very blatant way that will make it look like your un-secured site is not legitimate. To avoid the security warning that Google Chrome will display on non-secure sites, you’ll need to acquire an SSL certificate and install it on your site. Most businesses have one domain name and can purchase a simple SSL that covers a single site. If your site has multiple subdomains (shop.yoursite.com; files.yoursite.com; forum.yoursite.com) you’ll need a wildcard SSL that will cover all of the subdomains. There are companies that offer a free SSL certificate that can be installed manually on some hosting sites. However, the free option is difficult to manage on some of the larger hosting company sites and needs to be updated on a regular basis. To avoid headaches, I recommend purchasing an SSL certificate directly from your hosting company (the company that you pay to “park” your website). An SSL certificate should cost between $75 and $150 per year for a single site. 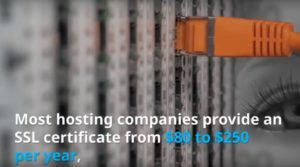 A ‘wild card’ security certificate that protects all of your sites subdomains starts around $225. The manual work required with some hosting companies is something you’ll most want to contact your developer to handle for you. If your website is built in WordPress and has plugins installed, you’ll need to make sure the new secure pages are working with the plugin. In addition, if your site has any hard-coded internal links using ‘http’ in the address, an audit may need to be done to make sure the links are updated or are redirecting properly for the secure pages. If you’re tech-savvy and want to try the free option for your SSL certificate, check out Let’s Encrypt (https://letsencrypt.org/). Depending on your hosting company, this could be a good choice, but be aware that sites hosted on some of the larger companies like GoDaddy don’t make it easy to use the free option. You should also expect to have to update the SSL certificate code on your site every 3-6 months when using the the free option. Although it seems like it’s just another way for internet companies to make money, an SSL security certificate is designed to ensure that the data sent and received from your computer to the site you’re browsing is encrypted and securely transmitted. The web is full of malicious sites that look legitimate but are set up by illegitimate companies in an effort to capture your data. Having an SSL certificate on the site not only encrypts the data being sent and received, but also ensures the site owners have gone through the process of applying for and implementing the security protocol. The Google Chrome security change will make it very obvious to visitors that the site they’re visiting may not be legitimate. To avoid being classified as a potentially insecure site, get your SSL certificate installed on your site as soon as possible. 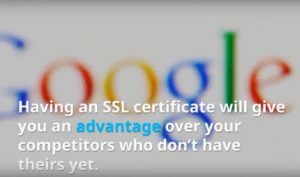 Having an SSL certificate correctly installed will give you an advantage over your competitors who don’t have theirs yet. Take action now so you don’t end up with visitors seeing site warnings when landing on your page. I created this video from a Science News Magazine article about Colorado scientists who are working on a new plastic polymer that can be recycled over and over again. 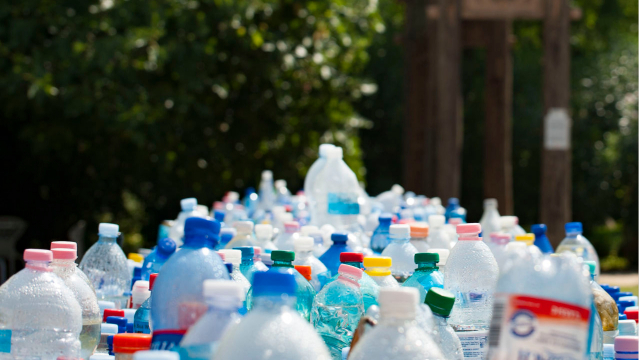 “A major impediment to plastic recycling is that most plastics degrade into molecules that aren’t immediately useful,” notes article author Laurel Hamers. That means that the plastics that people currently take time to recycle can only be re-used so many times before it degrades into something worthless. Polymer chemist Jianbo Zhu and his colleagues at Colorado State University in Fort Collins are attempting to solve this challenge. The scientists developing the new, endlessly-recyclable plastic polymers hope to someday commercialize the new plastic for widespread use. The Verge online magazine released a February 2018 news story about Vaunt, the new smart glasses being developed by Intel. A Google Glass product was released in 2013 to less-than-enthusiastic fanfare due to the odd design and a camera that some considered creepy. According to early reviews of Vaunt, the Intel smart glasses look and feel like normal eyeglasses. Vaunt glasses use retinal projection to put the display directly onto your eyeball. Early testers explain that when you’re looking directly ahead, there is no image to distract you, but by shifting your gaze down slightly, the display appears. The display needs to be fitted to each wearer’s eyes in order to work correctly. According to the Verge article, “There is no camera to creep people out, no button to push, no gesture area to swipe, no glowing LCD screen, no weird arm floating in front of the lens, no speaker, and no microphone (for now).” Control of the display will be done by small and stealthy eye and head gestures, eliminating the need to press buttons on the glasses. 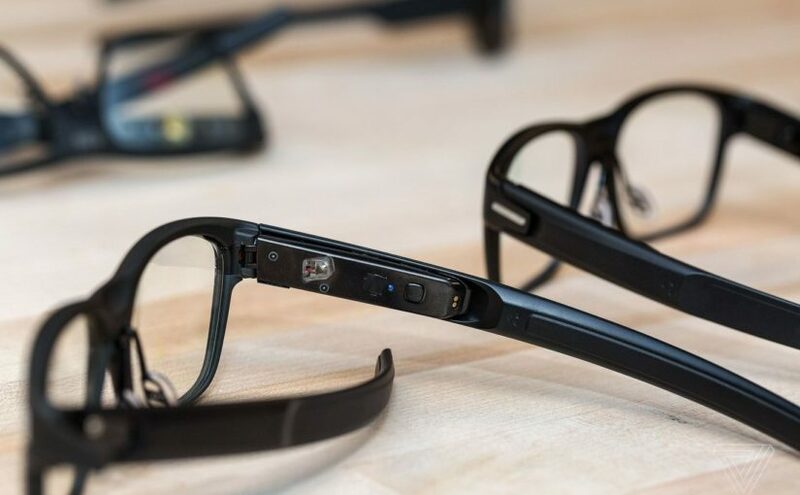 The technology consists of a low-powered laser, a processor, an accelerometer, a Bluetooth chip and a compass that sit on the inside of the stem of the Vaunt glasses. The laser is very low power and projects a red, monochrome image onto the wearer’s retina. Because the image is projected to the back of the retina, the image will always be in focus, regardless of whether the user is wearing prescription lenses. Why Would We Wear Smart Glasses? According to a Tech Crunch article about the new Intel glasses, the devices can send notifications from your phone, or the glasses might detect that you’re in the kitchen and send you a recipe. In one demo described by TechCrunch, it showed that you could see a person’s birthday and other pertinent personal info while you’re chatting with them on the phone. Intel says that the glasses are more stealthy than a smartwatch, allowing you to check notifications while doing other activities. Without an on-board camera, users might be more inclined to wear the glasses while avoiding the “big brother” feeling of smart glasses that are viewing and possibly recording surroundings. In the memorable 1977 Star Wars movie scene, Luke Skywalker sees the droid R2D2 project a 3D image of a woman draped in a white robe. “Help me, Obi-Wan Kenobi. You’re my only hope,” pleads Princess Leia before the projection is stopped. In an exciting breakthrough known informally at Brigham Young University as “the Princess Leia Project”, BYU researchers have succeeded in creating a 3D image that takes up real space and can be viewed from almost any angle. The January 24, 2018 news story released in the BYU newsletter describes the process as being similar to creating a 3D-printed object but using a single particle and a laser beam to illuminate it. 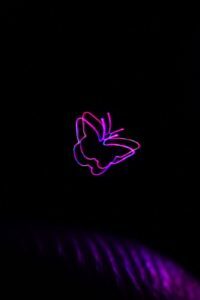 Daniel Smalley, a BYU electrical and computer engineering professor and holography expert, was able to move a single plant collagen particle through the air and manipulate it’s path into a pattern that, when lit up by a laser beam hitting it, appeared to be a single, static image. 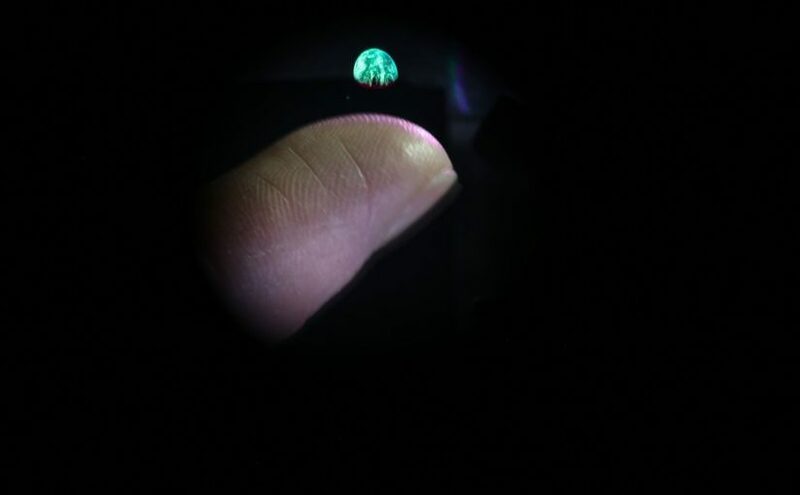 The researchers created a small image of planet Earth that appeared to hover over a fingertip. Think of moving a 4th-of-July sparkler quickly through the air in the dark – a repetitive circular movement seems to “paint” a solid circle image in the darkness. By moving a particle through the air in the lab and then lighting it with a laser beam, the result is what appears to be a static image. Smalley emphasizes that the images they are creating are not holograms. 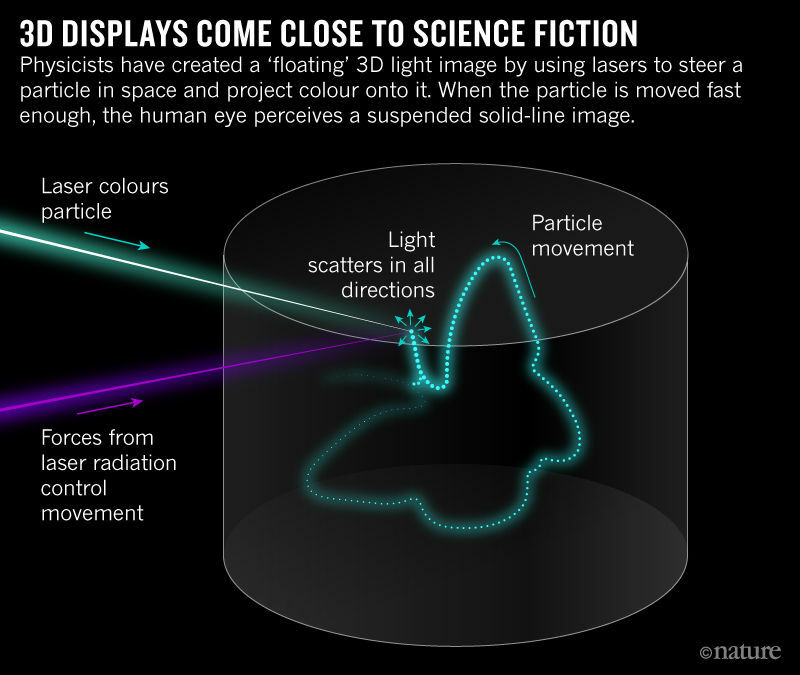 A hologram creates a 3D image by passing light through a 2D screen that manipulates the light’s path. The hologram technique can create stunning, full-color 3D images, but the light must always emerge from a 2D surface and thus can only be viewed from certain angles. Smalley’s 3D image is called a ‘volumetric image’ because the image is being physically created in 3D space. Although Smalley’s volumetric images are able to display an image in high resolution – currently up to 1600dpi – the images created so far are only millimeters across. Complex moving images and larger visualizations are the next step in Smalley’s research. To achieve a display that is larger and can be used for real-world applications, his team will need to find ways to speed up the movement of the particles and to control several of them at once. Is your website out of date? Does it look and behave like it was built in 2010? Do you want to sell products online but don’t know how? By popular demand, a one-hour presentation on using WordPress and Shopify for your online business. See site examples and what the tools look like on the back-end. Learn how easy it is to manage your own website using WordPress, and how to easily sell your products online using Shopify. WordPress is a website builder and blog software. It is the number one content management system (CMS) in the world and has been around long enough to have extensive online documentation and a deep trove of free and paid plugins to accomplish nearly anything on the site you can dream of. From a simple site with business information to massive corporate sites with custom development features, WordPress allows businesses of all sizes to maintain their website and easily update the layout and design. Shopify is a third-party online store platform that connects to your website. The software allows business owners to easily sell products online and provides add-ons for customizing your store to do exactly what you need. 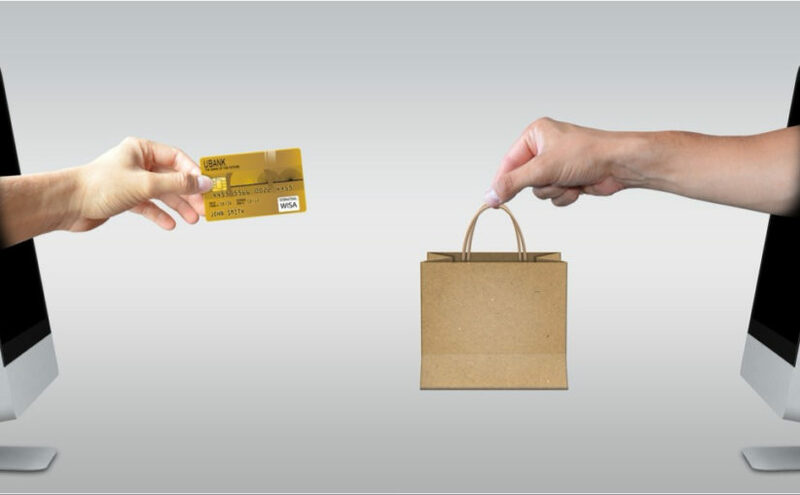 Shopify allows you to sell digital products, subscriptions, hard-goods and more. With extensive online documentation and support options, Shopify is a great choice for maintaining an online store, especially for small businesses who don’t have a lot of staff resources. Click here to view upcoming WordPress/Shopify workshop dates in your area, or CONTACT US to request a presentation or consultation for your business! 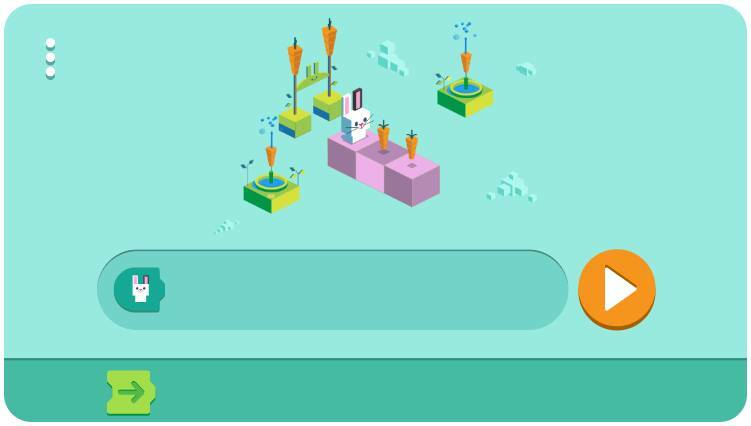 The December 4th, 2017 Google Doodle features an interactive game that demonstrates the basics of coding. The doodle starts with a basic command – move forward one block – before introducing additional commands such as turning and repeating. As the levels get more difficult, the game shows that rather than performing multiple steps with the same commands, groups of commands can be wrapped into one and then repeated. Although the doodle may seem like merely a game of moving a character on blocks using symbols, the exercise demonstrates the basic functionality of what coding is. For instance, the popular Ruby programming language uses “object libraries” that are referred to with code snippets. A coder doesn’t need to memorize the entire library, or even have to remember what code snippet to use to refer to the library. Coding interfaces now include drag and drop features to make the languages easy for beginners to understand. Many coders have pages of “cheat” snippets they use by copying and pasting when needed. Try out the coding Google Doodle yourself: https://www.google.com/doodles/celebrating-50-years-of-kids-coding. When my son was in High School, it was apparent that although he was smart and had an interest in science and technology, his passion was music and film. Thankfully, his High School had a fantastic music class that provided education on music production, hosting events, performing and songwriting. If it wasn’t for that class, I don’t think he would have made it through graduation. There are most likely millions of young men and women who have thought about science and technology careers but who have no real interest in math and physics. If you’re one of these people, or you know someone who is, below is a list of online pages that describe science and technology careers for artists. As someone who is a balance of tech-nerdy and artistic creativity, I’ve observed the need for artists of all types in science and technology spaces. One of the jobs I’ve coveted is the Artist in Residence position at CERN, the European Organization for Nuclear Research, home of the Large Hadron Collider, a multi-national particle accelerator project. The position surprised me because CERN is at the cutting edge of quantum research and the last place some might think artists would reside. But without art, science would be a cold, dark world. “Encouraging curiosity is central to our agenda, and introducing the public to experimental and open-minded artists is an amazing way to inspire creativity both within science and arts,” said FACT (Foundation for Art and Creative Technology) director Mike Stubbs in his call-to-artists in 2016. 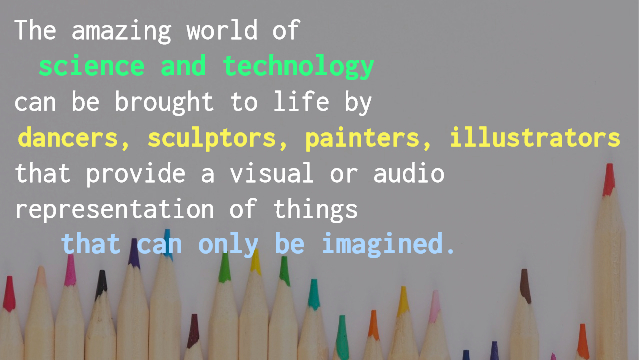 The amazing world of science and technology can be brought to life by dancers, sculptors, painters, illustrators, animators and other creative outlets that provide a visual or audio representation of something that can only be imagined, such as invisible particles that collide and interact for only fractions of a second but provide the framework for our entire universe. I’ve compiled a short list of interesting articles and information that highlights science and technology jobs and careers for artists. Check out the list of science/art jobs on this online job search site! Career path examples for people passionate in both art and science. Four interesting jobs that involve music and science. A brief essay on the author’s desire for more creative freedom in the sciences and the career path she chose. Great article that describes what happened when synthetic biologists were teamed with artists and designers. “I am happier and more productive when I use my brain differently,” says an Evolutionary Biologist and dancer who uses dance to choreograph DNA sequences. Do you have other art/science sites that should be added to this list? If so, please post them on my Facebook page! 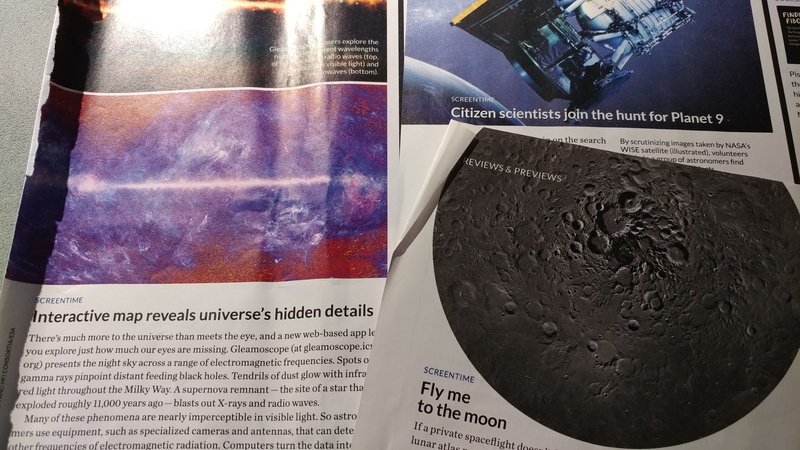 I marked several articles in past issues of Science News Magazine that have to do with free, interactive, online tools that any amateur or professional astronomer can use. Below are three online sites that provide interesting looks at the moon and the universe, and one that can even allow you to be the next person to discover a planet! Backyard Worlds allows citizen scientist to take part in helping to find Planet 9. Join in on the search for a proposed planet dubbed Planet 9! With an existence hinted from its gravitational influence on our other planets, Planet 9 may have already been photographed and is waiting for someone to point it out. The Backyard Worlds project lets space lovers flip through images taken by NASA’s Wide-field Infrared Survey Explorer satellite (WISE). The images are from a small area of interest where predictions point. Backyard Worlds uses the millions of images taken several times in the same area of the sky over time. The goal is to click through four images at a time of the same area of sky. When an “area of interest” appears to have changed positions over two or three of the images, the area is marked and submitted to the team of volunteer astronomers who then take a closer look. When an object is one that was not previously marked and warrants further study, telescope time is arranged to take a closer look. For more information, visit Backyard Worlds, or read the June 10, 2017 Science News article about the project. 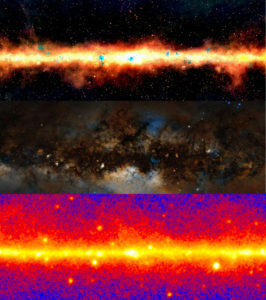 Views of the universe as Gamma Rays, Visible and Radio Waves using Gleamoscope. Many of the most spectacular phenomena in the universe occurs in ways that are barely perceptible in the visible light that our eyes can see. The Gleamoscope app, available both online and via an Android app, provides a way for us to view the universe in a range of frequencies to see the familiar night sky in new ways. The site’s smooth slider has settings for visible, Gamma Ray, X-ray, Far Infrared, and Microwave views of the universe. Celestial objects radiate energy of various wavelengths. Only a tiny band of wavelengths are visible light that our eyes can perceive – the bulk of the wavelengths are at frequencies that can be picked up by special radio or infrared telescopes. 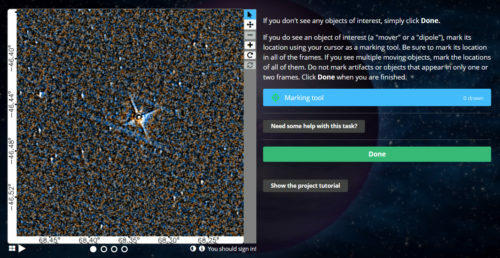 The Gleamoscope interactive map of the universe uses images from many observatories and radio antennas and provides a fun way to “see” the universe in a new way. Learn more at the Gleamoscope site and in the November 26, 2016 Science News article. Zoom in on the moon’s surface using photos from NASA’s Lunar Reconnaissance Orbiter Camera (LROC). 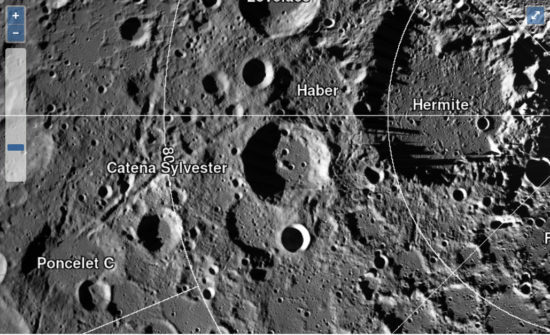 Fly to the moon from the comfort of your couch using NASA’s interactive lunar atlas. Thousands of high-resolution black and white images of the moon’s poles were snapped by the NASA’s Lunar Reconnaissance Orbiter Camera (LROC). The robotic spacecraft orbits the moon at an orbit of 50-200 kilometers (31 to 124 miles) to provide images with a resolution down to 2 meters. It’s about two hours before sunset and I’m on my front porch, facing west, reading a fascinating book in anticipation of an exciting astrophysics conference I’m attending in a week. The book is called The Cosmic Web, authored by J. Richard Gott, a professor of astrophysics at Princeton University. The upcoming conference is called Quantifying and Understanding The Galaxy-Halo Connection. The conference will be held at the Kavli Institute for Theoretical Physics on the University of California at Santa Barbara campus. Please keep in mind that I’m only a third of the way into the book, even though I’ve had it over a year. (Reading for pleasure has been a seldom-known luxury, with the exception of Science News magazine which I read voraciously every chance I get.) Please also remember that I am not an astrophysicist, but merely a student. My intent is to distill the scientific information in a way that is easy to swallow by non-scientists, so forgive me for oversimplifying some of these concepts. The particles inside the cube are the matter in the universe – stars and planets and dust and anything else with mass. (Research shows that observable matter makes up only 5% of the universe; the other 95% is “dark” matter, something we have not as-yet identified.) The computer simulations show different scenarios for how the galaxies in our universe may interact with the dark matter, with gravity, and with each other. The simulations vary depending on certain inputs such as how fast the universe is expanding and whether it will expand indefinitely or end up collapsing in on itself at a certain point. When we look up in the night sky, we can see with our naked eye the stars and constellations that are in our own galaxy, the Milky Way. The star we are most aware of is the Sun, which our planet, Earth, rotates around in a one-year cycle. Our star is rotating with billions of others around the center of the Milky Way galaxy. Our galaxy is rotating among other neighboring galaxies to form groups of galaxies, and those groups of galaxies cluster together to form superclusters. The superclusters are linked together through long filaments, sort of a web-like structure, which the title of the book I’m reading alludes to (The Cosmic Web). One mathematical model of this clustering shows our universe is made up of galaxy superclusters resembling meatballs floating in space. The meatballs contain matter made up of clusters of clusters of galaxies and are surrounded by vast regions of space with no observable matter and only a few thin galaxy strands connecting them. Another model shows that the universe is like a reverse meatball space resembling a block of Swiss cheese with empty gaps within it. Instead of a chunk of cheese, picture a two-car garage packed with empty refrigerator boxes neatly stacked. The galaxy clusters would live on the walls of the cardboard boxes and the corners where several walls meet would contain galaxy superclusters. The emptiness in the boxes is the space with little to no galaxies. So which universe are we a part of – the one made up of meatballs, or the one that looks like Swiss cheese? 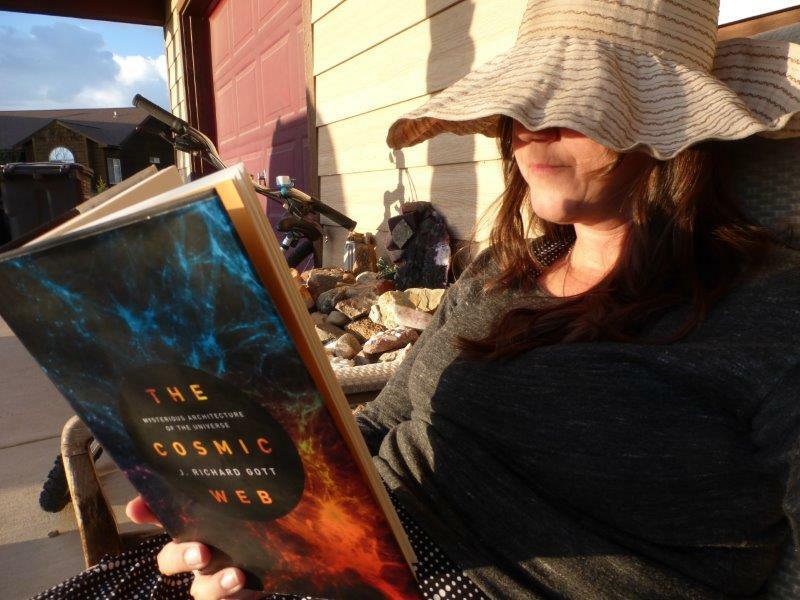 I’ll have to read more of the Cosmic Web book to know what the leading theory is, and I’ll share my thoughts when I learn more. The upcoming Galaxy-Halo conference will cover topics regarding galaxy clustering and how recent observations are helping to reinforce certain mathematical models. There are scientists working on theoretical models of galaxy clusters based on what we already know, and mathematicians who expand those theories to a cosmic scale by creating 3D models using modern supercomputers. Then there are the scientists who are using cutting-edge telescopes to record and observe the placement and movements of more and more galaxy clusters. The conference at the Kavli Institute will allow these theoretical, numerical and observational researchers to interact and discuss their combined research. I am as excited as a galaxy supercluster to get to be part of such a fascinating conversation and I look forward to sharing my own observational insights after the conference. 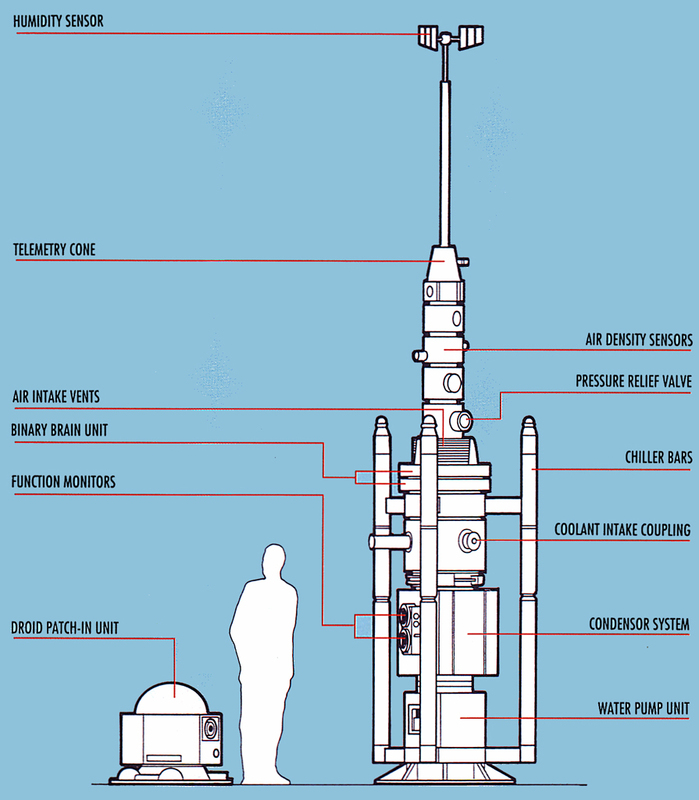 In the first Star Wars movie, Luke Skywalker lived with his aunt and uncle on a moisture farm, where fictional Moisture Vaporators were used to harvest water from the air on the hot desert planet of Tatooine. A water harvester, from Wang laboratory at MIT. Now, two scientists and their teams from UC Berkeley and the Massachusetts Institute of Technology (MIT) have teamed up to create a real-life “water harvester” and have a prototype that was able to collect 2.8 liters (about 3/4 gallon) of water in 12 hours. 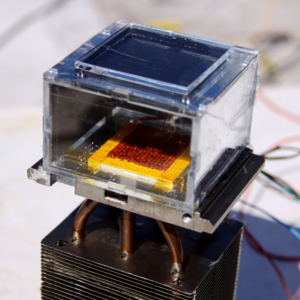 The device uses solar energy and could work in areas with humidity as low as 20%, which could have huge implications for low-water areas such as Africa. The story of the water harvester device was reported April 13th in Science and described in a South African Times Live article. Our goal is to support, educate, and share science and technology information in a fun and exciting way! copyright Quarkshow LLC. All Rights Reserved.